After a year of fundraising and organisation, the defibrillator is now fully fitted and available for the whole Cheriton community to use. A series of fundraising events in school together with some very generous donations from people who live in the village raised the required amount for the machine. In an unexpected turn of events, a conversation with the Alresford PIGS led us to contact a charity called The Community Heartbeat Trust who are responsible for the fitting and maintenance of defibrillators across the country. \much to our delight they offered us a fully funded defibrillator as part of a project with the Scottish&Southern Electricity Company. 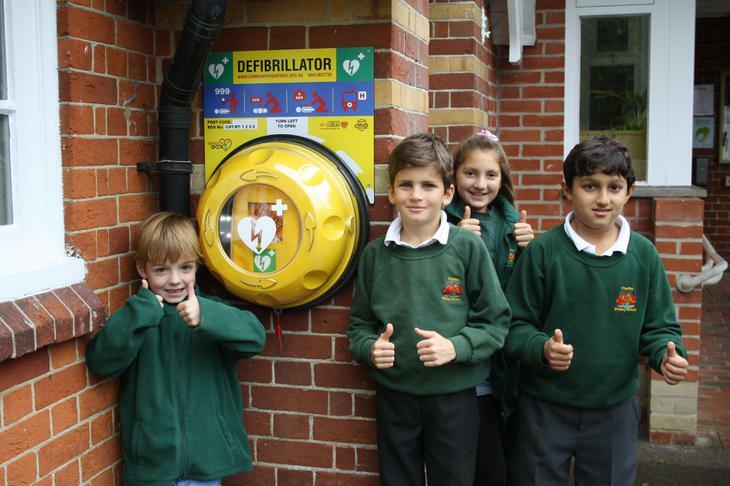 So, we now have a defibrillator in the school's front playground which is accessible to the public but also a sum of money to purchase a second machine to be sited in the village.